Mr Henri Bras, Head Chef, welcomes you to the signature restaurant inside the Lagos Sofitel. Contemporary French in style and design Bras (one of French cuisines most renowned faces) serves up all manner of culinary delights in this classicly themed dining space. An ever changing seasonal menu makes the most of local market produce and flys in special ingredients on a weekly basis. 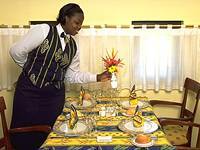 A Parisian gourmet's delight on the West coast of Africa.